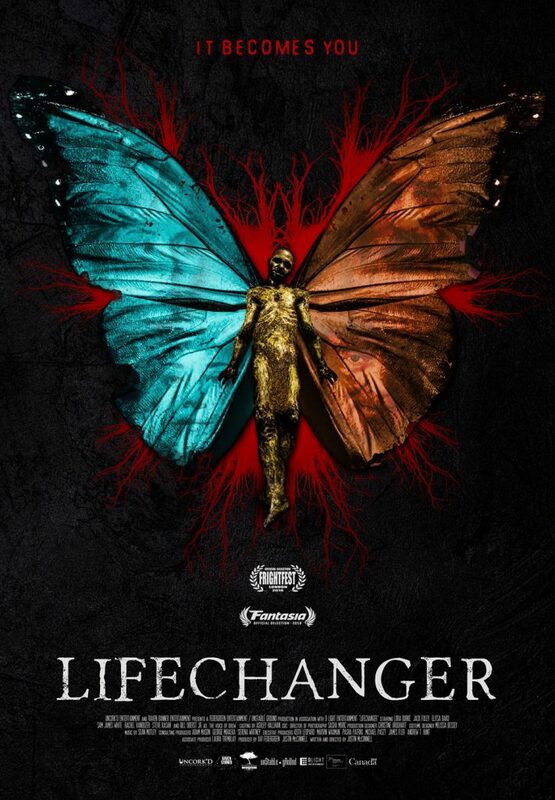 The lead character in LIFECHANGER is actually several lead characters, and it’s one of the movie’s strengths that writer/director Justin McConnell is able to unify them so that they collectively feel like one not-quite-human being to carry the story. Another is that McConnell takes a thoughtful approach to the material that still allows for a number of scary and gruesome highlights. LIFECHANGER, a world premiere at Montreal’s Fantasia International Film Festival, opens with a woman named Emily (Elitsa Bako) lying in bed next to a dead body. After cutting it up and disposing of the parts, she returns home, while we hear an internal monologue that (rather ambiguously) begins to explain her situation. Only thing is, the voice is male (in fact, that of horror regular Bill Oberst Jr.), cluing us in that Emily isn’t really Emily anymore. That’s confirmed when she is greeted by her boyfriend James (Adam Buller), who’s concerned that he hasn’t seen her for days, and she greets him back in a far less than loving manner. From there, the entity, which calls itself Drew, jumps into a detective (Steve Kasan), with more identities to come. The body-hopping isn’t a matter of choice as much as necessity, since Drew’s hosts start to putrefy before too long, and he has to find a new one before the rot becomes impossible to conceal. He has another goal as well: to connect with a woman named Julia (Lora Burke), who hangs out in a local bar. And so, she finds herself approached and befriended by a succession of strangers, though Julia doesn’t get to know them for very long. The focus on the body-switcher rather than the people opposing it or trying to track it down sets LIFECHANGER apart from similarly themed thrillers like THE HIDDEN. Just as crucial a difference is Drew’s motivation, as he is driven not by violent urges but a yearning for intimacy, to give his life some meaning and perhaps even redemption. His various incarnations leave a series of corpses behind, and yet McConnell and his cast don’t treat Drew like a villain. LIFECHANGER may be a modern body-horror opus, with effectively grisly makeup effects by David Scott and his Form & Dynamics company, but it’s also in the classic tradition of the Universal characters who were made monsters by their circumstances. McConnell has successfully wrangled a diverse and persuasive cast to create a uniform sense of Drew’s character, tied together by Oberst’s soulful narration. The writer/director also employs just the right amount of ambiguity to keep us intrigued, holding off for a while on details of Drew’s history and waiting to show us the actual process of transformation until just the right point in the story. As the de facto lead, Burke is consistently convincing as Julia deals with situations she sometimes thinks are odd, but doesn’t know are supernatural. Although McConnell largely commits to a grim and pensive tone, he laces LIFECHANGER with just the right amount of wicked humor—particularly when Drew takes over a dentist and goes in to see a little patient, building to a perfect punchline. There are elements of irony, too, like the setting of these events at Christmastime—a festive season yet one at which many people are at their loneliest, and which is also, of course, a holiday celebrating a birth. The fact that Drew is “born” into a new body repeatedly throughout LIFECHANGER, and can never claim a permanent identity for himself, is the tragedy that underlines and deepens the movie’s more visceral horrors. See an interview with McConnell about LIFECHANGER here.